Upcoming events in February and March at The Rocket! Well we’ve had a battering of storms recently and also been battered by some great events at The Rocket, with turn out to most of the events totally unscathed by the lashings of rain and wind thankfully!!! 8th and 9th Feb were our annual London Anime & Gaming Convention, with over 2500 people through the doors! It was a great weekend of comics, anime and retro video games… roll on the next one! 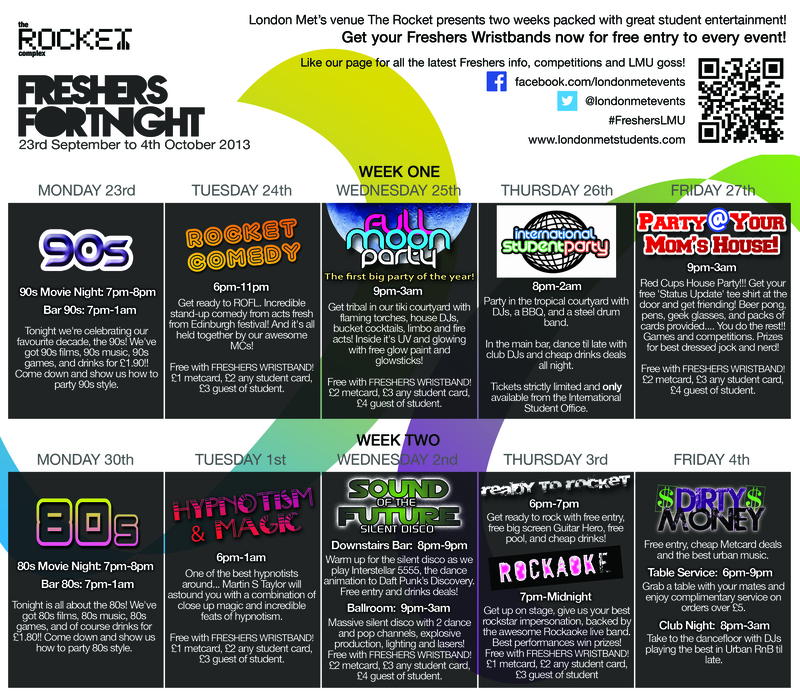 Rockaoke is Thursday 20th Feb! What the fudge is Rockaoke?? They are an amazing live band without a singer… the singer is YOU! The night starts about 7pm and goes on till 11pm, and it’s best fun with a few mates there to egg you on, so come on down and have a go!! See here for more info and facebook. 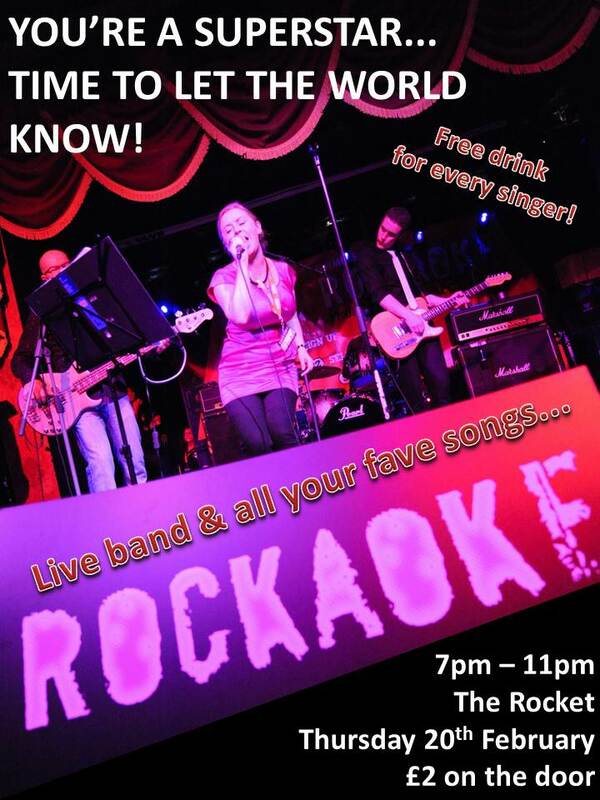 Rockaoke is £2 on the door, Thursday 20th Feb from 7pm. We’ve gone all Ibiza for this one! 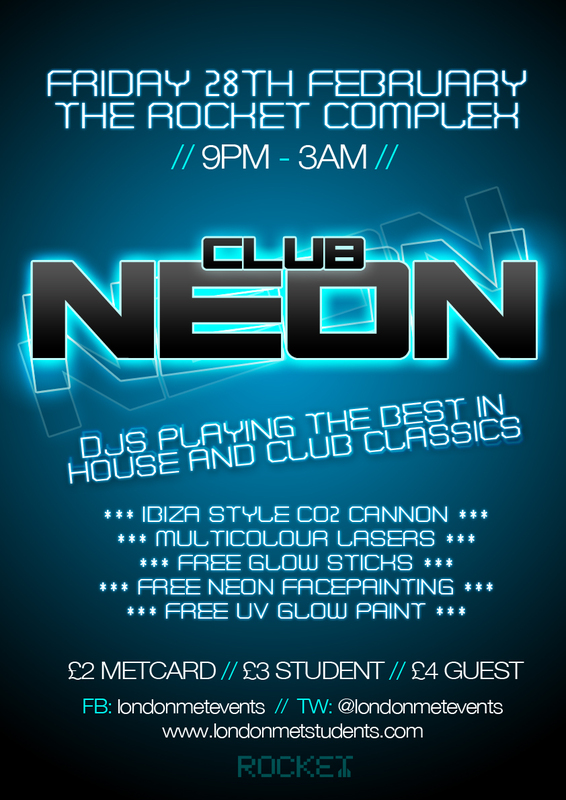 A full on glow rave with face painting, free glow sticks, laser and co2 cannon! Party starts at 9pm and we’ll be raving till 3am with DJs playing commercial and deep house, progressing to more chart friendly dance as the night progresses! We can’t wait for this one – facebook link is here!!! Student ID / Photo ID must be shown at point of entry! 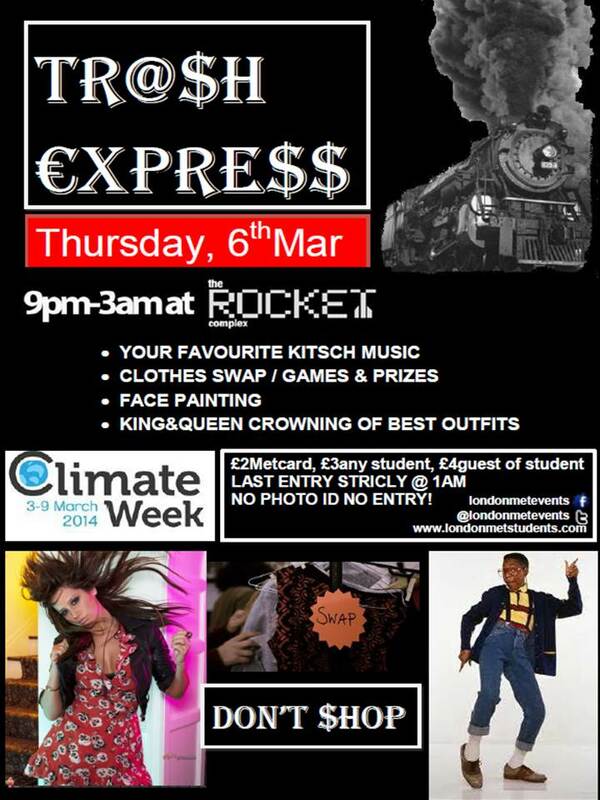 A Climate Week ‘Clothes Swap’ Clubnight Special at The Rocket Complex! The Trash Express makes a stop @ The Rocket Complex on Thursday 6th March providing a place for all misfits heading for fashion faux-pas utopia!! All aboard the Trash Express, stopping at The Rocket on Thursday 6th March! Come one, come all in your mismatched gear without fear of disgust… partying to all your cheesy 80s and 90s love to hate favourites from Aqua to Vanilla Ice! Clothes swapping is the name of the game, with prizes for various ridiculous and amazing outfits, clothes swap games and the crowning of our King/Queen of Fashion Faux-Pas! For most up to date information see the facebook event here. Photo ID must be shown on the door. The ACS present an evening of fashion, food and fun upstairs in the grand Rocket Ballroom. Remember you can find all our most up to date info for events and what’s happening at The Rocket Complex on our facebook page and twitter @londonmetevents! Follow us and be our friend! 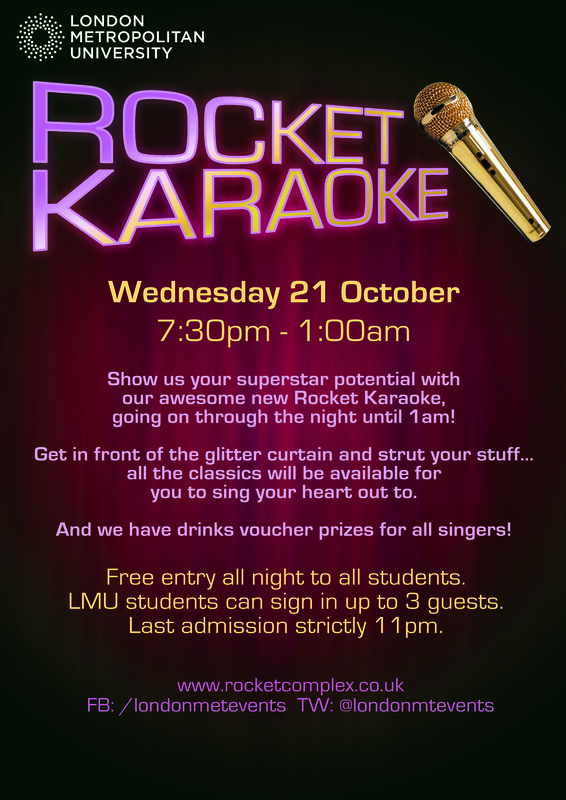 #Londonmet students, if you want to put on an event at The Rocket, then get in touch with us! !